The journey toward creating a customer for life begins with a guest's first stay. Market segment -- whether it's luxury, economy, or something in between -- largely determines what customers want most in a hotel stay. Though customers in all segments value price, reputation, room quality, and location when choosing a hotel, these basics merely cover the cost of entry in today's competitive hospitality industry, and they offer no guarantees for winning repeat business. To achieve sustainable, long-term growth, hoteliers must develop a deep understanding of the type of customers they want to attract, then offer an experience that is tailored to that specific group. By becoming more attuned to the preferences of current and potential guests in their segment, hospitality companies can more accurately target and build meaningful, lasting relationships with them. Gallup's 2014 Hospitality Industry study analyzed six distinct segments of the hotel market -- luxury, upper upscale, upscale, upper midscale, midscale, and economy -- to discover what guests really want from hotels. The findings illuminate what guests look for in a first booking as well as what engages them and drives their repeat business. Every hotel should make engaging customers its primary goal, because fully engaged guests -- those who are emotionally attached to a brand -- provide a financial premium, regardless of market segment. Customers who are fully engaged are less sensitive to price because their emotional connection with the brand moderates their concerns about cost. This holds true for every segment in this study and for every industry Gallup has studied. 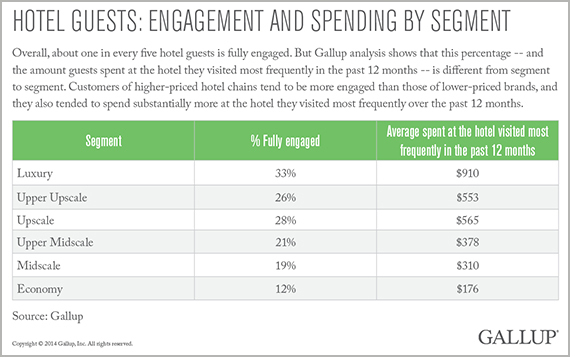 Overall, about one in every five hotel guests is fully engaged. But Gallup analysis shows that this percentage differs vastly by segment. Customers of higher-priced hotel chains tend to be more engaged than those of lower-priced brands. One-third of luxury guests are fully engaged -- the highest percentage for any segment -- and this segment is also the most lucrative. Luxury customers spent an average of $910 at the hotel they visited most frequently over the past 12 months. Economy guests are the least likely to be fully engaged (12%) and spent $176 on average at the hotel they visited most frequently in the past 12 months. The journey toward creating a "customer for life" begins with a guest's first stay. Beyond the factors guests require from all hotels -- quality, convenience, price, and brand reputation -- hoteliers must carefully examine their target segment for cues on how to entice new customers. Gallup found that when luxury and upper upscale guests select a hotel for the first time, creating the right environment is vital to winning them over. These customers value the look and feel of the property, and they trust their own judgment and observations when choosing a hotel for the first time. Customers in the remaining segments, on the other hand, are heavily influenced by others when deciding to book a hotel for the first time. Upscale customers rely on recommendations from friends, while upper midscale guests defer to the preference of family members and friends. Midscale guests depend on information on the hotel's website when initially deciding to book a room. The exception is economy customers, who rely on a hotel's brand reputation when booking an initial stay. Price, location, and quality remain top considerations for all customer segments in repeat booking. However, a hotel's brand reputation becomes less crucial at this stage, as customers focus less on the hotel's image and more on their personal relationship with the brand. To encourage guests to return often, hotel staff must provide them with reliable service, solve their problems, and respond enthusiastically to their needs from the very first visit. When employees help guests solve problems, those customers can become more engaged than guests who didn't experience a problem during their stay. For luxury guests, price is not a top factor in repeat booking. The look and feel of the hotel continues to be a crucial consideration, but responsive employees and their ability to solve problems become more important. Service reliability is important to upper upscale and upscale guests, while responsive employees appeal to upper midscale and midscale guests. Economy customers also value employees who are responsive and can solve problems, but they still put price first when rebooking, as do midscale customers. Even the most price-sensitive midscale and economy guests who are fully engaged spend more than their actively disengaged counterparts. Astute hoteliers should challenge industry norms. Hotels can be prone to "gold plating," or adding services and products that increase cost but don't necessarily boost market share. To avoid this trap, hoteliers must understand which products and services are meaningful to the customers they want to attract so they can offer amenities that will entice customers without increasing price to a level that will drive guests away. 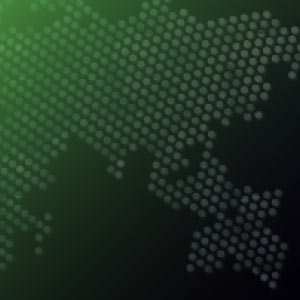 Gallup's analysis shows that overall, customers strongly agree with eliminating specific services -- such as the hotel retail shop, the hotel bar, concierge services, in-room dining, the fitness facility, and luggage services -- to pay less for their stay. Customers in every segment strongly agree with doing away with the hotel retail shop. Luxury and upper upscale guests strongly agree with jettisoning luggage services, while upscale and upper midscale guests would give up in-room dining. Guests overall strongly agree that they would be willing to pay much more for significantly improved services such as Internet connectivity, comfortable beds, and responsive employees. Luxury guests strongly agree with keeping and improving comfortable beds, in-room dining, and responsive employees, while customers in all other segments strongly agree with keeping and improving Internet connectivity, comfortable beds, and responsive employees. When asked which hotel products customers would give up to lower costs, more than half of guests strongly agree they could do without the in-room bar, robes, and valet parking. Customers across all segments strongly agree with eliminating the in-room bar, robes, guest room radios, and valet parking. About half of guests overall strongly agree that they would be willing to pay more for significantly improved in-room television, bathroom soap, and complimentary Internet. Luxury customers strongly agree that they would pay more to improve bathroom soap products; upper upscale and upscale customers would improve free Internet; and upper midscale, midscale, and economy customers would like a nicer television -- and would be willing to pay for one. Certain elements -- such as price and location -- are understandably important in bringing first-time customers through the door. If employees can create an emotional connection with guests during their initial stay, they'll be more likely to return the next time they need a hotel, even if another brand is offering a better price or a more desirable location. The first visit is a crucial opportunity for hotel staff to create a customized, differentiated experience that will encourage guests to keep coming back. Winning repeat business comes down to understanding what is important to customers of your hotel and its market segment, offering products and services that matter most to guests, and ensuring that your staff members understand and can deliver on guests' preferences. Hotel staff members who can handle problems with ease, provide reliable service, and be responsive to customers' needs represent an enormous competitive advantage. Gallup analysis suggests that hotels would be far better off if they cut amenities that customers don't value and invested those savings in selecting and developing employees with the right talents and problem-solving skills to engage guests with world-class service. By engaging customers, hotels are more likely to reap significantly higher share of wallet from their "customers for life." In the economy segment, which makes up 19% of the hospitality market, about one in four customers are actively disengaged. So brands that turn these customers around can potentially attract a substantial share of this market. Hoteliers should not assume that economy guests are driven solely by location, quality, and price point when booking repeat visits. Once these criteria are met, economy guests look for hotels with responsive employees who can solve problems. These hotels typically operate with just a few employees, so their performance is particularly crucial in creating engaged customers. Selecting and developing the right employees will help economy hotels create guests who are fully engaged with the brand. Luxury and upper upscale customers consider the look and feel of the hotel as one of the most important factors for first and repeat visits. They tend to rely on their own observations about a hotel, rather than others' recommendations, when booking a stay. Previous Gallup analysis showed that guests who perceive a hotel lobby as energized and enthusiastic are more likely to stay at that hotel more often than guests who feel a lobby is orderly and business-like or chaotic and disorderly. So luxury and upper upscale brands should hire and train staff who can set the right tone. Astute hoteliers should challenge industry norms, such as the current standard of having a bar in every luxury hotel -- or excluding a hotel bar from an economy hotel. Though hoteliers should evaluate decisions like these with profitability, hotel positioning, and in-house and local market demand in mind, a hotel bar could address an unmet need and be a draw for economy guests. Not all guests prefer viewing streaming content on their personal devices over watching television. Guests across all segments strongly agree that they would pay more for improved televisions and cable channels in their rooms. Hotel guests might want to watch movies on a personal device, but they also want to view programs such as sports events or news programs on their guest room television. Though Gallup's analysis suggests that brand reputation is a top factor when customers select a hotel for the first time, guests prefer responsive employees when booking a repeat visit -- and this is true across all segments. Similar findings have emerged in other service industries, indicating that responsive employees are crucial to building brand engagement. All hotel segments can benefit from selecting talented employees, creating an engaging work environment, and training employees how to resolve guest problems. Gallup's latest hospitality study reveals the preferences of the up-and-coming generations of guests -- who, through their sheer numbers, could reshape the industry.